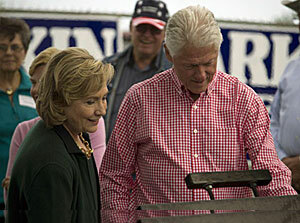 Hilliary and Bill Clinton at the Tom Harkin Steak Fry. Former Secretary of State Hillary Clinton has given the broadest hint yet that she is a likely 2016 candidate for the Democratic Party’s presidential nomination. Clinton spoke this afternoon at Senator Tom Harkin’s 37th and final “Steak Fry” fundraiser. She hadn’t set foot in the state since the might in 2008 when finished third in Iowa’s Caucuses. News of her visit sparked a firestorm of speculation about her intentions for 2016, and Clinton sent them soaring soon after she started speaking this afternoon. “I’m here to tell you that there are many more chapters to be written in the amazing life of Hillary Clinton,” Harkin said, as the crowd cheered. Clinton mentioned “that young senator from Illinois” who wound up beating her here in 2008. 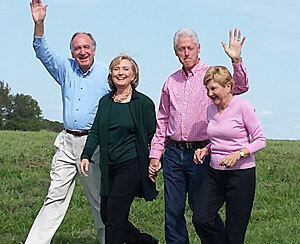 Tom Harkin, Hilliary Clinton, Bill Clinton, Ruth Harkin (R-L) Photo by Debbie Noe. And, after talking about the anxiously-awaited arrival of her first grandchild, Clinton joked about all the attention her appearance at Harkin’s event had generated. “You know, it does really feel just like yesterday when I was here at the Harkin Steak Fry, or as my husband likes to call it: ‘The Harkin Stir Fry,'” Clinton said, laughing along with the crowd. Bill Clinton was the final speaker at the event, but he focused instead on the 2014 election and did not mention having his wife serve in the same office he held from January 20, 1993 ’til January 20, 1999. Both Clintons paid tribute to retiring Senator Harkin, praising his “progressive” voice and record over the past 40 years in congress. 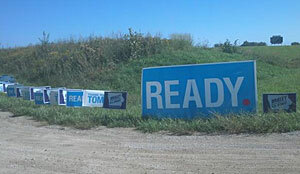 Signs leading into final Harkin Steak Fry. Harkin delivered a speech that was a sort of retrospective of his political career, his voice sometimes cracking with emotion as he started with his first unsuccessful campaign for congress back in 1974 and his decision in 2013 not to seek reelection. But, Harkin — who is 74 years old — said there “comes a time to gracefully bow out” and let new leaders step forward and that’s why he decided not to seek reelection this year.